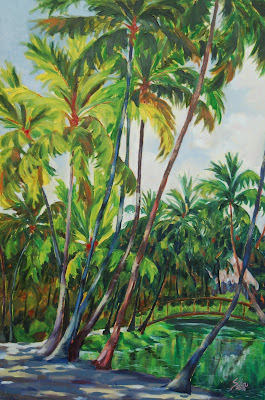 Artist's Comments: I was drawn to this subject by a combination of the vertical palm trees reaching overhead off the canvas and the shady pathway leading to the small bridge in the distance. I concentrated on highlighting the mid level palm trees by using brighter shades of green and contrasting them with really dark shadows in the tallest, closer trees. The foliage in the background was painted with a light orange wash which I allowed to dry before layering over it with variations of different greens but, trying to mute their tones to achieve distance. I struggled as always with the shadows and I went over them three times before getting to a point where I was “okay” with them.